On 5th November 2016, Phuket Thailand – Non Profit Organization PLAJA held the Memorial service for Indian Ocean Tsunami victims and held the charity dinner party as well for the affected areas caused by the earthquake / tsunami in various parts of the world. In spite of the fact that PLAJA was holding the memorial service every 26th December that the date was the Indian Ocean Earthquake and Tsunami ( Sumatra Earthquake) occurred in 2004. We have changed the date to 5th November that is because the day is enacted as the World Tsunami day under the United Nations. 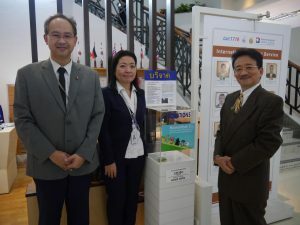 We believe that it able to contribute raising awareness of the importance of disaster prevention there is not only phuket but also various areas where earthquake- devastated district in the world. 16:00 The Memorial Service for Indian Ocean Tsunami victims at Sunwing Kamala Beach Resort. Reading by Nichi-ren sect monk from Japan. 18:00 The charity dinner party to raise the donation for the support the areas where caused by the earthquake or tsunami that are occurring in various parts of the world. The charity dinner party was held as grandly exceeded 120 participants. We got a great support from UOTERU SUISAN Japanese restaurant in Phuket which is well known by local, they performed a tuna filleting display for the charity show and from TSUNAMI CRAFT/ IDEA EAST, they performed the SAWORI- free weaving and sales. We prepared PLAJA original T-shirts of the World tsunami day for sales and there was the performance by Thai classical instrument as well. The proceeds from this event will be donated to support disaster stricken areas.